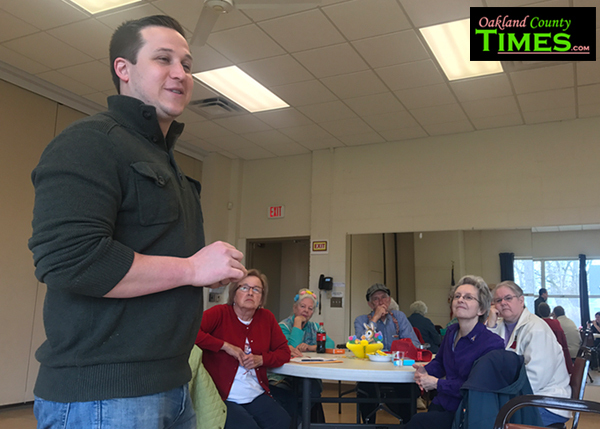 Ferndale, MI – On a day where the Legislature was on Spring Break, State Representative Robert Wittenberg was still working, taking time to visit with constituents of the 27th District. 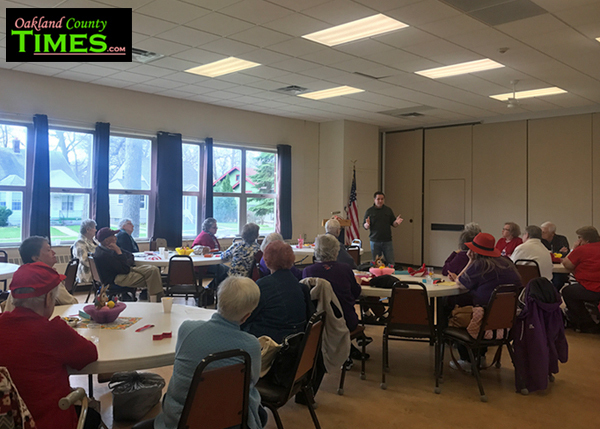 The Ferndale Seniors group welcomed him as their speaker for their April 12 meeting. Subjects being tackled in Lansing cover a variety of subjects, including hiring guidelines for the Michigan Department of Corrections, auto insurance regulations, income tax, gerrymandering and absentee voting. Wittenberg said the bill, which was introduced by a Republican, has bipartisan support. Another issue that is the subject of discussion in Lansing is that of auto insurance. HB 4013 would allow drivers to show their proof of auto insurance to police on their cell phones instead of paper copy if they chose. Introduced by Republican Peter Lucido, the bill passed the House on March 14 with 108 yays and 0 nays. HB 4010 increases the penalty for driving without insurance and requires someone caught driving without to pre-pay for a six month policy before being able to have a license plate and registration. It also adds an additional $50 fee to the registration. Law enforcement may impound and keep the vehicle of the uninsured person until they are able to get a new registration. If the person is unable to obtain insurance and registration within 90 days their vehicle may be sold. This bill is currently in the Insurance Committee. Wittenberg said he thinks this bill is harsh, and that even law enforcement groups have opposed it. Representative Wittenberg was pleased that an effort to reduce the state income tax was unsuccessful. Twelve Republicans crossed party lines to vote with all but one Democrat against lowering the income tax rate, which would have cut funding for services. Governor Snyder also opposed the tax rate reduction because of the shortfall it would have left in the budget. Wittenberg was among those Democrats who voted against the reduction. “Cities have been cut tremendously. This money goes for roads, for police, for all the services residents expect,” he said. Wittenberg talked to the seniors about gerrymandering, which is the process by which the party in control at the time of redistricting manipulates district boundaries for strategic advantage. Some districts are created to lump as many voters of a party into one district to limit the number of seats that would be competitive for that party. Congressperson Brenda Lawrence’s District, the 14th, snakes through Metro Detroit from Pontiac through West Bloomfield and Farmington Hills along 8 Mile into the Grosse Points and back down along the Detroit River, picking up a solidly Democratic voter base. This means the 14th will remain Democratic while leaving the Districts around it more available to Republicans. Wittenberg is advocating for redistricting reform that would make the process of drawing lines more neutral. He recommended that residents get informed about the issue by checking out www.countmivote.org. Changing the way districts are drawn requires a change to the State Constitution, and groups like CountMIVote may be part of that effort in the coming months. Another bill Wittenberg co-sponsor of, introduced by Jim Ellison of Royal Oak, was HB 4034 that would allow for absentee voting without reason. “I think everyone should be able to vote absentee if they want to,” he said. “This is a democracy and we should make it easy for people to vote.” This bill is not supported by Republicans and is not likely to be heard beyond committee, he said. Wittenberg holds coffee hours and other opportunities for constituents to be heard. Learn more at http://housedems.com/state-rep-robert-wittenberg. Learn more about the Ferndale Seniors at http://www.ferndalemi.gov/Services/Recreation/Seniors/Senior_Programs.